These Buitoni Agnolotti’s (similiar to ravioli) arrived at our house as another perk of being a member of the FoodBuzz Tastemaker Program. I love mushrooms so I was psyched to try them. Picture fresh pasta filled with a mixture of crimini & portobella shrooms, cheese and garlic. All good things. To go along with them Mike and I decided to prepare a light sauce as to not mask the flavors. Good choice because the mushrooms were not overly flavorful. The balsamic brown butter sauce was a Giada recipe and was a perfect compliment — sweet and nutty. I would definitely pick these up if I saw them in the grocery and I was looking for a quick tasty meal. check out those vanilla beans! You all know I purchased Giada De Laurentiis’ new cookbook “Giada’s Kitchen” in order to attend the signing event. Well, the book is actually really nice. The pictures are beautiful and the recipes are inventive. The first recipe we decided to make was the “Butternut Squash and Vanilla Risotto” (we used acorn squash). Mike “the king of risotto” was intrigued by the use of vanilla in the stock*. I was super surprised to find out a single vanilla bean was $12 ($8 on sale)!!! The dish turned out fabulous. The vanilla was not at all overpowering. It just sits in the background adding a bit of sweetness. The modifications we made to the recipe included using 1.5 cups of wine (a santa lucia highlands chardonnay worked perfectly) and we puréed some of the squash and added it in along with the chunks. I would suggest serving this as a side or starter since it is a bit heavy. Recipe:Buy the book or grab the recipe from Serious Eats. Mike and I spent Sunday afternoon with celebrity chef Giada De Laurentiis. Actually we stood in line for 2.5 hours and talked to her for about 30 seconds. 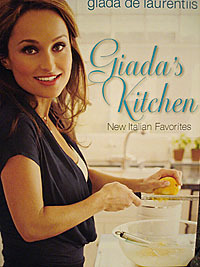 So, I hear about a Q&A and book signing with Giada at Santana Row for her new cookbook Giada’s Kitchen. 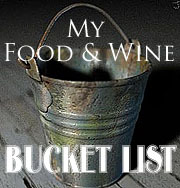 It sounded like fun so I purchased a book from Sur La Table and with it came a ticket to the event (I had #6). This was our first book signing so we had no idea what to expect. We arrived 45 minutes early to scope things out. Since it was a ticketed event I thought there would be no more than 50-100 people allowed to see her. I WAS SO, SO WRONG! When we walked up to Sur la Table there was already a line around the corner and into the 2nd section of the parking lot (at least 150 people). So what did we do? We got in line of course. Then I sent Mike on a recon mission to see why the heck the line was so long and what happened to the Q&A. He returned to tell me that the line was for the signing and that the Q&A was at the stage set up in the center of the row and that if I wanted to see it I would have to lose my place in line. The person in line before us had ticket number 395 which she had purchased the day before so there was potentially going to be 500 + people waiting with their bag-o-books. We decided not to leave the line and take turns going to hear Giada speak. She promptly arrived at noon and did a 10 minute Q&A which wasn’t super informative because I assume her die hard fans were standing in line. We heard about her new baby, taping of the upcoming shows … typical questions. Flash forward two hours and we had our signed book and a moment with Giada. If you know Mike he wasn’t gonna just say “Hi” and take his book he needed a little chit chit time (which he took 😆). She was nice and we were ushered to the side where you are allowed to take a photo. The day didn’t go as expected but we can scratch this off our bucket list. I will think long and hard before going to another Sur La Table signing. I really think the function could have been run better. I was happy to hear that Giada was going to stay until the very last book was signed otherwise I’m sure you would have read about a pot & pan riot in the SJ Mercury news the next day.